PETA invites you and the growing number of Australians who oppose cruelty to animals to help put an end to this exploitative “sport” by refusing to patronise racetracks or support Melbourne Cup betting events in the office. You can show your desire for change whether you’re working on the day of the race or able to attend a boycott event. You can also inform your friends and family about the tragic lives that horses used for racing are forced to endure and start the conversation with your FREE Facebook profile picture frame now! Use your Facebook profile picture to tell your friends and family that you’re boycotting the cup. People still talk about the horrors of the 2014 event, when one horse fractured a cannon bone and was killed on the track and another collapsed and died in his stall after the race. The following year, a mare lay on the ground with a shattered leg until she was killed. But the headlines hide the extent of the carnage: between July 2016 and July 2017, 137 horses died on Australian racetracks. That’s one every 2.6 days. Horses used for racing typically weigh more than 500 kilograms, are supported by ankles the size of a human’s, and are whipped to make them run around tracks at speeds of more than 50 kilometres per hour while carrying humans on their backs. They’re victims of an industry that is rife with drug abuse, injuries, and race fixing, and many of their careers end at the abattoir. Few of these horses are retired to pastures, because owners don’t want to pay for a horse who doesn’t bring in any money. 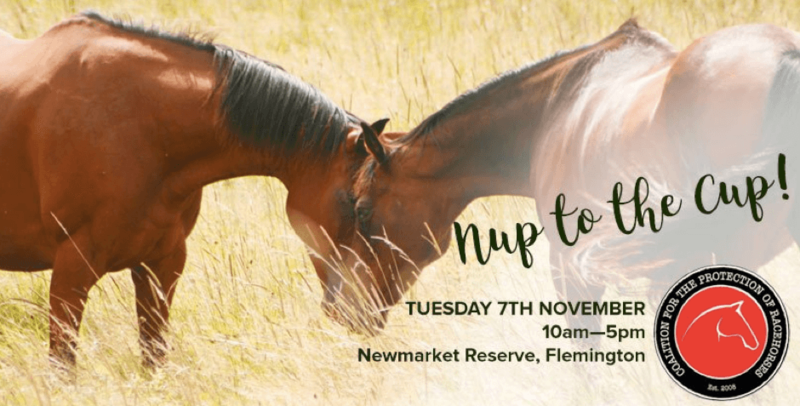 If you’re in Melbourne, the Coalition for the Protection of Racehorses will be hosting an alternative event to horse cruelty, the fantastic Farshans on the Field. The event is being held right outside Flemington Racecourse, making a strong statement to racegoers that boycotting cruelty doesn’t mean missing out on fun. All are welcome to join this child-friendly, fun-filled day of food, live entertainment, human races, and more! For other boycott events around the country – including in Sydney, Brisbane, the Sunshine Coast, Hobart, and Canberra – see this fabulous events list. We understand that many people are required to attend a work event and will be asked to participate in the “Cup Day Sweeps” taking place. This can be very challenging when you want to be social and involved in your workplace culture but don’t want to bet on horse race cruelty. It’s absolutely fine to attend work events to socialise and be positive and friendly with all your colleagues whilst also refraining from betting on the race and choosing to leave during the actual screening of the race. So you don’t have to explain your office civil disobedience to every person who asks “Who are you betting on?” you can download PETA’s printable office badges. This badge template will fit any conference name tag at your work and can be easily printed out and folded to make a desk card. You might just find that there are many other compassionate comrades who don’t find Melbourne Cup Day a cause to celebrate.